Gibbs cleaning services include buffe ring and refinishing for hard floors, such as hardwood, tile, concrete,stone, and marble. We use the highest quality floor finishes to ensure your floors maintain an attractive and long-lasting surface finish. Power-washing is a popular option for floors, walls, and other surfaces where a more powerful clean is needed. Our power-washing services make it easy to get rid of stubborn stains and build-up without the use of harsh cleaning chemicals. 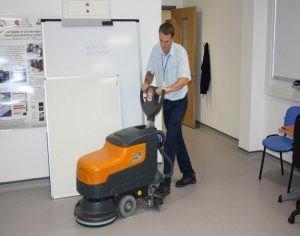 Need a different specialty cleaning service for your workplace? Contact your local Gibbs Cleaning services today and let us know what you need. Our customized approach to cleaning and array of cleaning specialties means that we can accommodate nearly any commercial cleaning request. The reasons people apply wax to floors are to give the floor shine and make it easier to clean. Waxing floors is easier than it used to be, and people regularly wax even no-wax floors these days. If your vinyl flooring had a no-wax finish but has faded, you might want to reseal it instead of applying wax. Wax can be applied, but resealing will last longer. Before applying any wax, your floor must be clean. Be sure to use whatever cleaner your floor requires and then follow up by mopping with clean water to get rid of residue. The floor should be completely dry before waxing. You can get waxes that do and do not require buffing. No buff waxes are easier, of course, but waxes that require buffing give better and longer lasting results. Follow the wax directions and apply as thin a layer as possible.